A long awaited social with a good friend of mine Nicky had arrived Nicky who introduced me to my new society water just under two months ago, manages and organizes the societies monthly work parties also acting as one of the chairman for the society…so I knew I would have to be on my best behaviour. With this long-awaited social booked to start at 8:30am I arrived 2 hours late Nicky had already setup in a Swim known as the ‘Party Swim’ a perfect choice for a social. The Party Swim is located on the middle lake out of the 3 lakes on the complex. A lake I had not yet fished as my focus is solely on the back lake that holds possibly seven 30+ Carp with a large head of low, mid and high 20s. We chatted for a while looked at rigs talked about the fish the middle lake holds…Nicky told me the middle lake even though it was small lake possible held two 30+ Carp one of them was named ‘The Slate Grey’ with a sister Carp coming in at around 27 to 28lb named ‘Baby Slate’ This news sparked me into setting up my rods as the time was getting on being around 2pm in the afternoon. 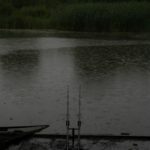 The Left had rod I cast at a showing fish close to a grassy bed of weed running along the far bank of the lake…again the rig looked great as it hit the surface I felt it down and it landed with a donk. 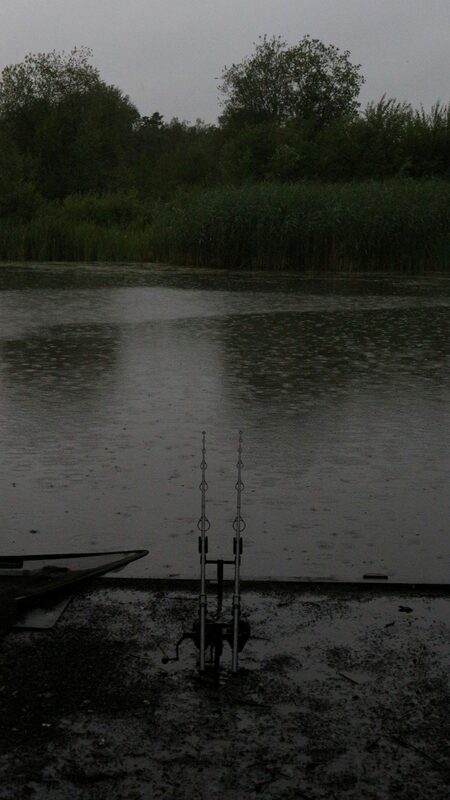 Perfect…I had decided to only fish single #Pop-Ups as there were plenty of fish around bubbling and rolling. Time to set up camp. We sat down to eat a curry Nicky had very nicely knocked up, chatting and complaining why all the bobbling and showing Carp we had seen hadn’t given us a beep on ether of our rods. 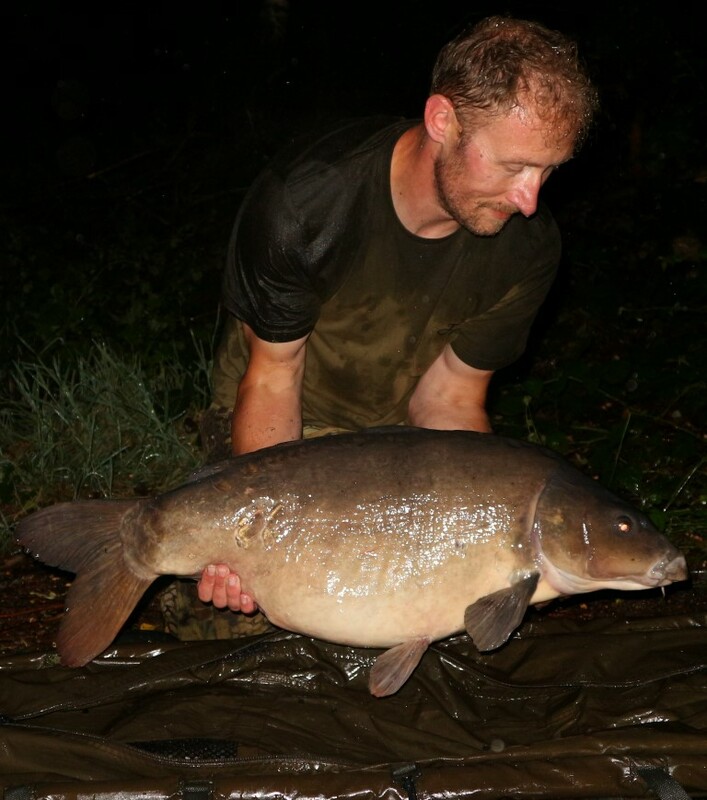 9:30pm’ish beep,beepbeeeeep my right hand rod went into melt down ‘line stripping off my reel’…I struck into the fish and sure a huge bow wave going left towards a weed bank…Biggun, I shouted to Nicky. 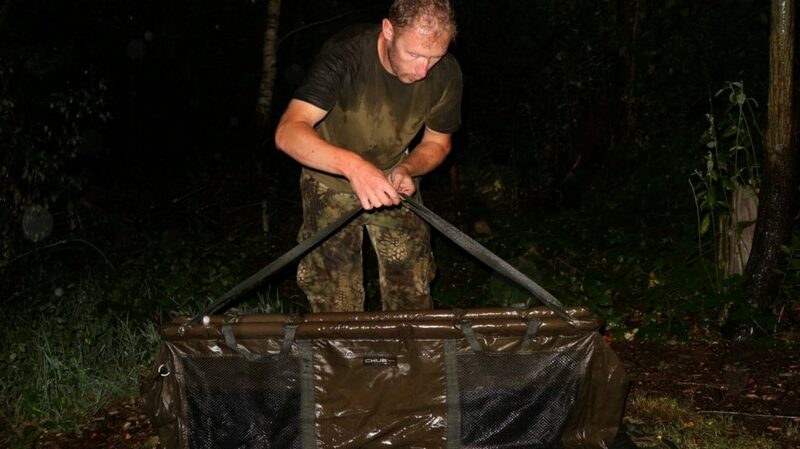 It had now been raining for an hour breaking though the canopy of tree’s that were sheltering our swims…the carp know with about 2lb of weed covering its head came in ferly easily Nicky passed me the net and a large Carp looking very similar to The Slate Grey that I’d been told about slipped into the net. Is that The Slate Grey, Nicky! I said…starting to clear the mass of weed that the Carp was covered in to find the hook had fallen out…it’s a big fish I said looking at the width of its back, let’s get it photographed first as its raining. 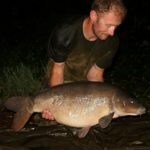 I grabbed the unhooking mat and the camera setting it up for a night shot as it was now dark…checking the carps fins were flat agents its body I attempted to pull it out of the water realising I would need two hands, I walked it over to the unhooking mat now knowing this was a good sized fish, posed for a couple of unsuccessful night shots as I hadn’t set my camera up correctly…luckily managing to get one or two useable shots in the dark and the pouring rain. Time to weigh her! Connecting the scales to the weigh sling and zeroing, 3lb 10oz the sling weighed when wet they shot around to 29lb 08oz Wow a new Personal Best 2lb 01oz bigger that Common Carp I had caught from my local Canal just over a year ago…The KARPER Chocmint Ultra-Fluro Pop-Ups had caught me a new PB my first named Carp and one of the biggest fish in the lake the “Baby Slate”, first time fishing it. Writing this I realize It’s still sinking in!